Made in England for the UK and Beyond! Farwest Aircraft, Inc. announces with great pride its local manufacturing and calibration capabilities in Derby, England (UK). This facility will supply local and regional customers with a close-by manufacturing and supply center, reducing delivery time and shipping cost, consequently extending same time zone services for our customer’s manufacturing, calibration, and AOG requirements. Derby, England is the home of highly skilled technical labor and world class manufacturing, including world renowned companies, such as Rolls Royce, Toyota, and Bombardier. This is another important step in Farwest’s globalization plan, enhancing our successful and customer appreciated local manufacturing in the US, United Arab Emirates, Germany, Japan, Australia, and Central America. For additional information, please feel free to contact us at info@farwestair.com. Farwest Aircraft, Inc. proudly announces its collaboration with Continental Aviation Services (CAS) of Abu Dhabi, United Arab Emirates (UAE). This will allow Farwest to better serve our customers throughout the Middle East, with a local manufacturing and supply center. This is another significant milestone in Farwest’s globalization plan, augmenting our already well established local manufacturing in the US, Germany, Japan, Australia, and Central America. CAS is one of the oldest Logistics & Support Companies in the Middle East. An Emirati company established in AbuDhabi in 1994 with many years of experience and acquired competences, CAS has become a leader in commercial equipment, providing innovative solutions and systems integration for their customers. The collaboration between Farwest and CAS will bring high competence manufacturing and superior customer support to this region,supplying our respective customers with service unparalleled by any other licensed manufacturer of aircraft related Tooling and Ground Support Equipment. Proudly Made in Germany for Europe and beyond! Farwest Aircraft, Inc. proudly announces its collaboration with Metall & Design, of Frankfurt Germany. This collaboration will now allow Farwest to serve our respected customers throughout Europe, Scandinavia and the Middle East with a much closer local manufacturing and supply center. Metall & Design is a leader in high precision parts and has outstanding manufacturing capabilities. Metall & Design is also very well known throughout the Germany aviation community for its reliable support and outstanding quality. According to Jay Marshall, President of Farwest Aircraft Inc., this is just another step in the future globalization plans of our company. Both of our companies match each other perfectly, may it be in our way of thinking as well as our customer support and quality philosophy. Farwest in addition to its US and Germany location already manufactures in Japan, Australia and Central America. The “Made in Germany” venture is already a great success, securing significant orders from several European customers. We welcome our friends from Metall & Design to the Farwest family! 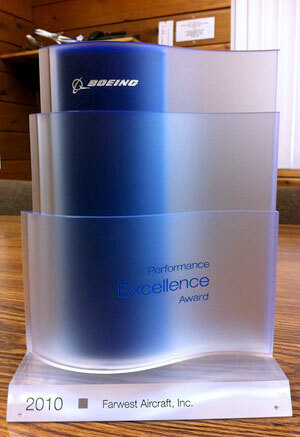 The Boeing Company Performance Excellence Award Three-Peat! 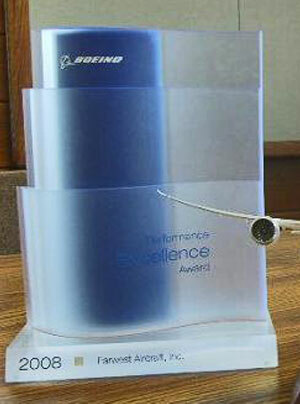 Farwest announces with great pride to be chosen once again by The Boeing Company, to be the 2010 recipient of The Boeing Company Performance Excellence Award. Having received this award now for 3 years running shows our continued dedication to quality and on-time delivery, unsurpassed by any competitor. Many thanks to The Boeing Company for their acknowledgment and continued support! 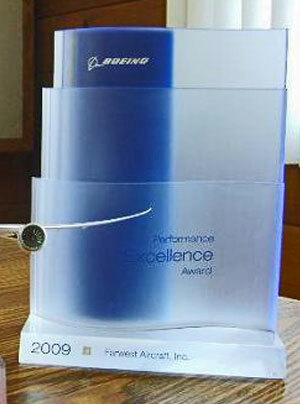 Farwest Aircraft shines again, receiving The Boeing Company performance Excellence Award for 2009. With great pride and appreciation, Farwest is pleased to be chosen by The Boeing Company as a recipient of their Performance Excellence Award for the year 2009. Being a recipient of this award for two years running, shows our continued commitment to excellence and the dedication of all of Farwest’s employees to our products and customers. The Farwest Management extends its appreciation to The Boeing Company for this honor and pledges our continued support for the future. Farwest Aircraft proudly announces its affiliation with JMS Aero, Germany! 15. April 2010, Lahr/Germany & Edgewood/WA, USA. FARWEST Aircraft Inc. and JMS AG entered into an agreement with the general approach that both parties’ sell the products of the other party’s to various airlines and maintenance facilities around the world. JMS AG develops, manufactures and globally markets equipment and tools, used for aviation service and manufacturing. JMS AG owns designs for GSE Products, has design capacity and in-house experience available and has good sale relationships to several customers in different regions worldwide. The products of JMS AG are of the highest quality and rival any other competitors equipment unsurpassed. By combining our product lines both companies are now able to provide their respected customers a much needed additional “one stop” source for their GSE and Tooling needs. JMS products will also enjoy Farwest’s global “After Sales Service”, provided by locations in Costa Rica, Japan, Australia and the United States. For more information, please feel free to contact JMS AG and/or Farwest Aircraft, Inc. respectively. The Farwest Team is pleased and proud to announce that The Boeing Company has awarded Farwest Aircraft the Performance Excellence Award for the 2008 calendar year. This award is presented only to the best of The Boeing Company vendors with the fewest quality rejects and the most excellent on-time deliveries, covering not only the commercial aircraft division, but The Boeing Company entire organization. Farwest Aircraft is well on its way to being recognized again for the year 2009. As of April 7, 2009 Farwest had delivered 3,163 tools to The Boeing Company with “0” quality rejects and only 5 late shipments. We are very proud of our staff; a staff that takes pride and ownership into every product that goes thru our doors. The enclosed picture shows some of Farwest’s Edgewood facility’s employees proudly displaying The Boeing Company Performance Excellence Award, as well as the awards themselves on the following image. Please also note the banner in the background of the group picture, displaying our motto “Every Customer Counts”, a slogan that each person in our company stands behind.